Yeah, it might be a tight fit, but I see a spot where a plumber can snake around the pipes to fit in a SWCG right before the valve right side of the chlorine puck dispenser. It won't be pretty, but plumbers get creative with PVC pipes.. LOL... But I gotta say, your equipment pad seems quite dense, especially the two pumps are quite close to one another. It might be little challenging to clean out the basket in the water feature pump. Luckily, you won't have to clean out water feature pump basket often. My pad was initially about that size (6ft long). I demanded my PB to extend it another 3-4 feet. Ok, thanks for that, I've got a bit of time before I plan to convert it to salt. I want to get down the road a bit, make sure all the kinks are worked out. And believe it or not the pad is 9x3 but has all the extra filters he included which really packs things in. Oh I see. I see you got the Paramount Ozone and UV system. I initially included the exactly the same model, but I decided against it after doing some research mainly because I wanted to K.I.S.S. (Keep It Simple..). Tell us how you like the system after using it for awhile. Got concrete today, we're going with cool deck. No more mud pit! They had been prepping the patio area for the past few days. They finished the rebar last night and showed up today to pour. Getting closer. Next big steps are to build out the kitchen. Oh happy day! The end of the mud!!! SWEET! What color of decking will you be using? Anyone have Sherwin Williams suggestions for a light/blonde travertine coping? Me? I would not go "matchy" with the coping as there is no real way to "match" it. I would go on the same color scale but go a little darker so there is a contrast between the two. This will also tie it in with the stone on the wall of the spa. In fact...........hummmmmmmmmm pick your fav color on it and use that as your color!!! I second Kim. Highlight the copings by selecting darker cool deck color. That looks classier I think. Thanks for the advice there, my wife agrees with you both, so we'll look to go in that direction as we pick a color. 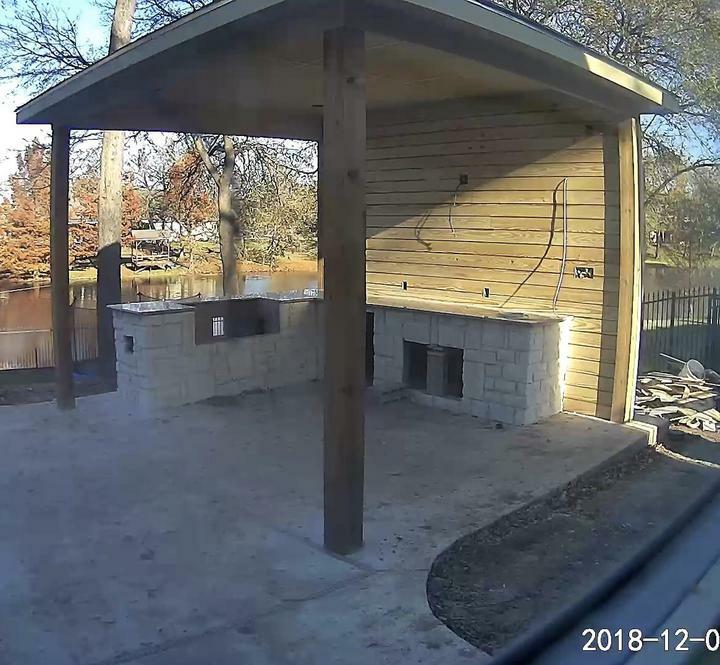 I'm very happy with how the concrete deck turned out, I'm surprised at how well it manages the water flow. My question is about a single spot on the patio that seems to be holding water. Is that something they can fix / raise when they put down the cool deck texture? I know from experience at my house growing up that these low spots can be be mold/dirt magnets. Here's a pic of the spot after it had been drying a while, this is the only spot on the patio that holds water after I hose it down. I am no expert, but I believe cool deck is also some sort of concrete/plaster, so I don't see why not. One thing I should forewarn you is that cool deck texture will have lots of high and low spots, so even with a good gradient those low spots will trap water and dirt. Generally, cool deck will require more cleaning over the smooth concrete surface based on observing the state of my neighbor's cool deck. I hose off my travertine deck once or twice a month with water during dry season. I've been letting rain do the work for me lately. So sad to see so little work done How may builds does he have going on? Good question, he said at one point he had 5 going. And he uses his own crews for part of so I think he was running short of labor. Since my last post he's kicked it into overdrive, they've painted the kitchen and decking, finished the kitchen electrical, installed the lights and fan, finished fixing all the sprinklers, PLASTERED and now we're filling. Sod is supposed to be re-installed tomorrow. I'll post pictures shortly but I can say we don't like the deck color we chose so we're going to repaint it ourselves using a darker color. We tried to get a little too cute and should have just picked a color we had a sample of. Can't wait to see pics! Keep the water flowing when you fill. Don't want a ring around the plaster that can happen if you stop the flow of water while filling!